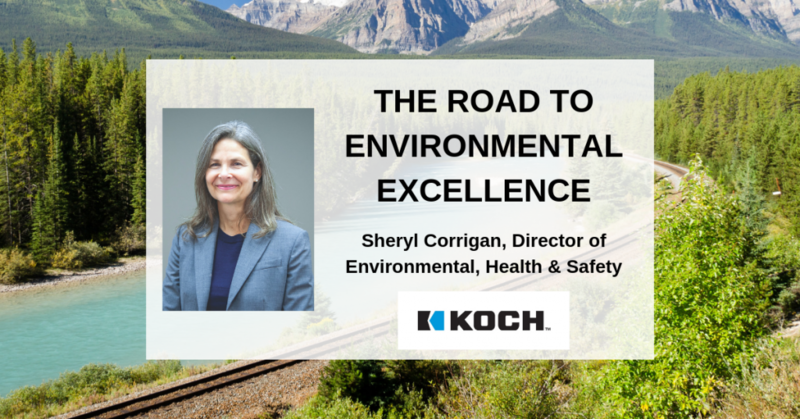 Operational Excellence in Oil & Gas | Operational Excellence in Oil & Gas Summit: THE ROAD TO ENVIRONMENTAL EXCELLENCE - An interview with Sheryl Corrigan, Director of Environmental, Health & Safety at Koch Industries. Sheryl, can you tell us a little bit about your professional background leading up to and including your role at Koch Industries? I have been in the environmental, health and safety arena for over thirty years, though it certainly doesn’t feel like it’s been that long. I started my career working in the public sector at the state, regional, and local levels. Then I moved to the private sector, first as a technical consultant, and then as an environmental leader for 3M. Post-3M I led the environmental regulatory agency in Minnesota. My opportunity at Koch Industries started about 12 years ago and has been incredibly rewarding. I’ve been blessed to have had many career experiences and opportunities on both sides of the regulatory aisle that have given me tremendous insight. Probably the most impactful career experience for me was the time I spent as commissioner for the Minnesota Pollution Control Agency in the early 2000s. This helped me to more fully understand that regulators have an important mission that is separate and apart from the role of business. But the two work in concert to deliver benefits to society that are mutually reinforcing. I’m currently the director for the environmental health and safety capability at Koch Industries, where I help our companies achieve our vision of environmental health and safety excellence and to ensure that we are fulfilling our guiding principles around stewardship and compliance. I’m a helper, I’m a supporter, I’m a counsellor, and I make sure that we are doing what we say we’re doing. In your opinion what does operational excellence truly mean in today’s world? Is responsibly managing your company’s resources and supply chain enough? To answer this, I think it’s important to take a step back and talk about the role of business in today’s world. At Koch Industries, we think about the role of business as helping people improve their lives by providing products and services they value more highly than their alternatives. We do so responsibly—meaning we act with the proper regard for others-- while consuming fewer resources. If we do this well over time, we make a profit. That profit allows us to reinvest and innovate to create even more value for people, which should yield more profit and so on, creating a virtuous cycle of mutual benefit. Operating responsibly also means we’re interested in profiting byeconomic means – where the market decides who wins and who loses – not by political means – such as government subsidies and mandates. There is a strong tie here to operational excellence. How do we make those products that people value? How do we improve our performance in a way that improves processes and quality? How are we advocating for a level playing field for all? Operational excellence is the mindset, the set of capabilities that we apply to get to that better product. In the past, you’ve said that Operational Excellence goes beyond just managing your resources responsibly; it’s about creating long-term value for society and not about making a quick buck. Can you elaborate on that? The key word here is ‘responsibly’. At Koch, responsibility is synonymous with stewardship, part of our guiding principles. We are focused on operating with the interests of others at the forefront, meaning we manage our resources and our businesses with our stakeholders, our neighbors, and our communities in mind. Being responsible means being great stewards of our business. How is that embodied at our facilities and across our businesses? Number one, we put safety first. The value of human life is inestimable, so we want to make sure that we’re protecting not only the folks that work for us, but also the folks outside our fence line. We put an enormous amount of resources into our process safety program to make sure that our processes are in control and our equipment is reliable. Our communities expect this, and we want to meet their expectation. To continue to read this exclusive interview, click here.